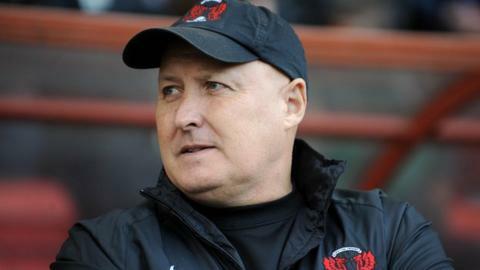 Cardiff City manager target Russell Slade is at their training base, after tendering his resignation as Leyton Orient boss. But legal discussions are thought to be delaying Cardiff's hopes of appointing the 53-year-old. The O's have put Kevin Nugent in charge for Saturday's clash against Rochdale. In a statement Orient said they did so "following the departure of Russell Slade on Wednesday". On Monday, Orient rejected an approach by the Bluebirds for Slade, who had been their manager since 2010. Slade spoke of his frustration at not being permitted by the O's to talk to Cardiff following the League Cup defeat to Sheffield United. If his resignation is formally accepted, it would open the way for Slade to hold talks with Cardiff about a move to the Championship club. Cardiff City's legal team are discussing a compensation deal with Leyton Orient, who have referred the matter to their lawyers. "For Russell it's a big step and a chance to manage at Championship level and you know that chance may never come along again. I don't blame him for taking that option if that's the option he's taken. It's obviously an awkward situation, but only two games ago the Orient chairman was saying he had one game to save his job so you can't have it both ways"
The Welsh side have been without a manager since Ole Gunnar Solskjaer stepped down on 18 September. Slade - named League One manager of the year for the 2013-14 season - has been one of the favourites to take over since Solskjaer departed last Thursday. Young and Gabbidon, who have been put in caretaker charge, oversaw Saturday's 2-2 draw at Derby and Tuesday's League Cup defeat by Bournemouth. Slade, who held talks with Orient owner Francesco Becchetti about his position last week, had said he was "proud" to be linked with Cardiff, who were relegated from the Premier League at the end of last season. Slade led the O's to third place in League One in 2013-14, but saw his side beaten on penalties by Rotherham in the play-off final.